Derek Thompson at The Atlantic reblogged a visualization of America’s annual eating habits. 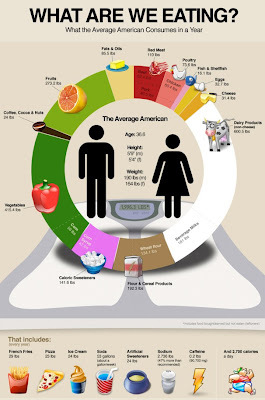 According to Thompson’s graphic, besides almost 85 pounds of fat and oils and 110 pounds of red meat, the average American consumes about 42 pounds of high-fructose corn syrup annually. Forty-two pounds is the size of about six newborns, and pretty gross prima facie. But just how bad for you is it? The American Heart Association recommends that women consume no more than six teaspoons of added sugar per day and that men consume no more than nine, which amounts to about 100 and 150 calories, respectively. Forty-two pounds is the equivalent of 3,865 teaspoons of corn syrup, or almost 11 per day. Nobody should be eating that much added sugar. Exacerbating the problem is that high-fructose corn syrup has been shown to be worse than other sweeteners when it comes to weight gain. Last year, researchers at Princeton University discovered that rats supplied with corn syrup got significantly fatter than rats fed regular sugar, even when caloric intake between the groups was the same. What makes that particularly frightening is how frequently food brands have begun using corn syrup in place of real sugar, which is more expensive. So while corporations are able to tighten their belts with corn syrup, America is forced to loosen its own.